The Monsignor and I almost met for such a dialogue last December, but it did not come about. This time we were scheduled to meet in Bellaria, Italy, at a conference whose theme was “The Mystery of Human Existence.” I arrived there with my wife and a score of fans from the USA, on March 31st, scheduled to address the audience of over a thousand the next day. The Monsignor was nowhere in sight; but he was there the next morning to hear my presentation. “I drove the whole night from Rome to hear you,” he said. We are not alone -- not just in the vast universe, but in our own solar system; There is one more planet in our solar system, orbiting beyond Pluto but nearing Earth periodically; Advanced "Extraterrestrials” -- the Sumerians called them Anunnaki, the Bible Nefilim -- started to visit our planet some 450,000 years ago; And, some 300,000 years ago, they engaged in genetic engineering to upgrade Earth's hominids and fashion Homo sapiens, the Adam. In that, they acted as Emissaries for the Universal Creator -- God. "We have much to talk about,” Msgr. Balducci said to me as he came forward to congratulate me on my presentation; "I have great esteem for your scholarship," he said. Well then, I asked Msgr. Balducci, does it mean that my presentation was no great revelation to you? We appear to agree, I said, that more advanced extraterrestrials can exist, and I use science to evidence their coming to Earth ...I then quote the Sumerian texts that say that the Anunnaki (“Those who from heaven to Earth came”) genetically improved an existing being on Earth to create the being that the Bible calls Adam. My conclusion regarding your presentation, Msgr. Balducci answered, is that more than anything else your whole approach is based on physical evidence, it concerns itself with matter, not with spirit. 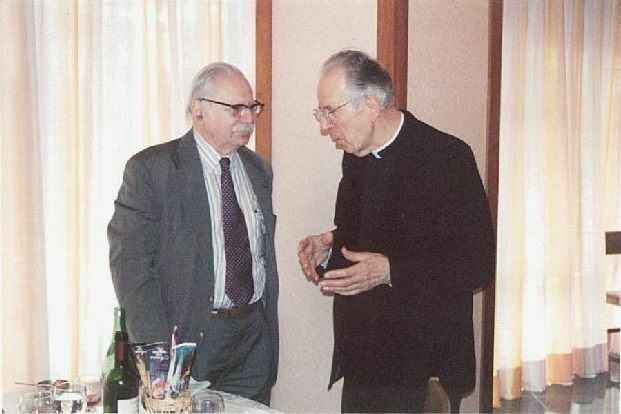 This is an important distinction, "because if this distinction is made, I can bring up the view of the great theologian, Professor Father Marakoff, who is still alive and is greatly respected by the Church. He formulated the hypothesis that when God created Man and put the soul into him, perhaps what is meant is not that Man was created from mud or lime, but from something pre-existing, even from a sentient being capable of feeling and perception. So the idea of taking a pre-man or hominid and creating someone who is aware of himself is something that Christianity is coming around to…The key is the distinction between the material body and the soul granted by God."